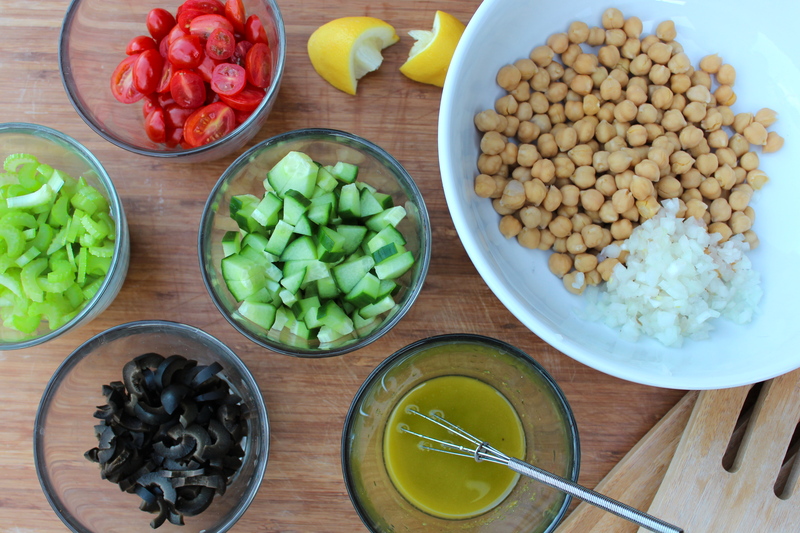 Leisurely Sunday evenings call for simple and fresh dishes, like this chickpea salad. The vibrant pesto citrus sauce perfectly compliments the bright, crunchy vegetables. To make it even better, the leftovers double as the perfect mix of veggies and sauce to make a pasta salad. What more could you want? 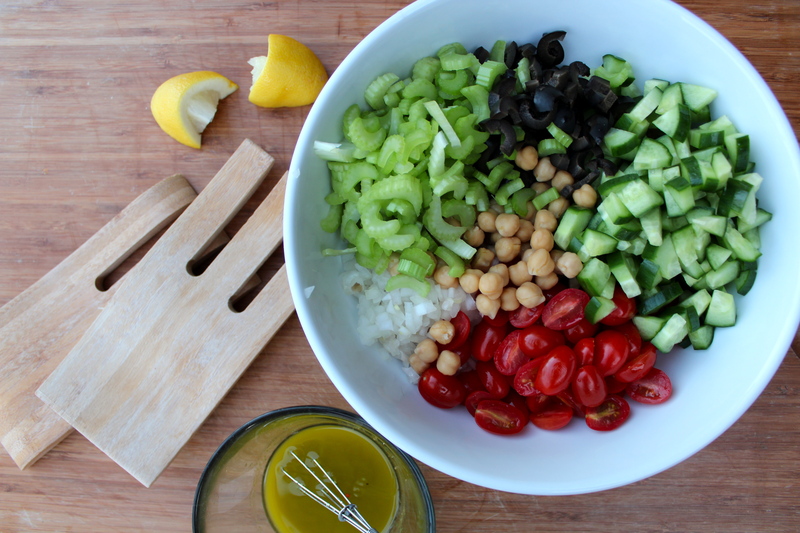 Mix together all of the vegetables in a bowl and set aside. Whisk together dressing ingredients, tasting for salt. Add the dressing to the vegetables and toss to coat. Serve immediately. This salad can be customized however you want. If you prefer green olives to black, use those instead! If you really love tomatoes, you could add more. If you prefer a more acidic dressing, feel free to add an extra squeeze of lemon juice! It is totally up to you! When chilled, the olive oil in the dressing tends to harden. If you aren’t planning to serve this right away, wait to add the dressing. 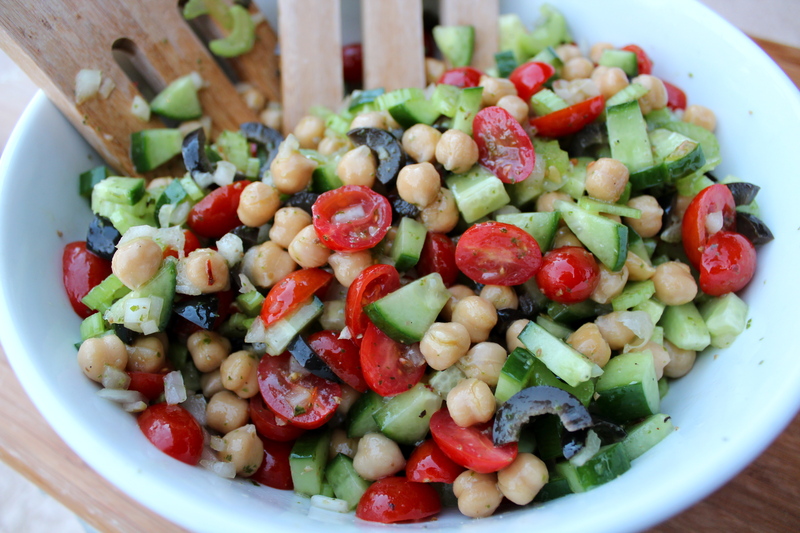 Store it in a separate in a container that can be shaken to loosen up the olive oil before adding it to the salad. Yum!! I love pesto, so I’ll use any excuse to eat it. 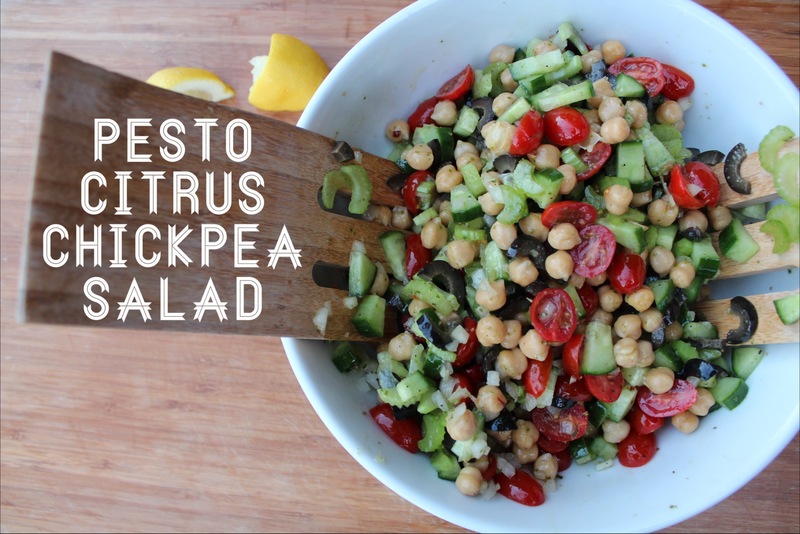 Normally I toss it in with pasta or spread it on a sandwich, but I love how you’ve used it as a dressing for the chickpea salad. I love pesto, too! Every summer we take our huge harvest of basil and make pesto out of all of it, so we always have an incredible amount. My family has been doing that for years, so we’ve come up with some pretty innovative ways to make use of it. Good luck! I’m not a very good gardener either, but my Dad has a great green thumb that my family is thankful for. I just wish we could have a bigger garden! We only grow a few herbs and tomatoes. It’d be nice to have a huge garden. At my parents’ house, the deer always got to ours before we could harvest anything. We gave up on everything but the geraniums — the deer left those alone for so long that the three little flower plants turned into a huge bush! I wish we had deer here! We don’t really have that problem, but occasionally the tomato plants will get attacked by birds.